If you think Mitsubishi is on its way out of the North American market or doesn’t make fun cars anymore, think again. 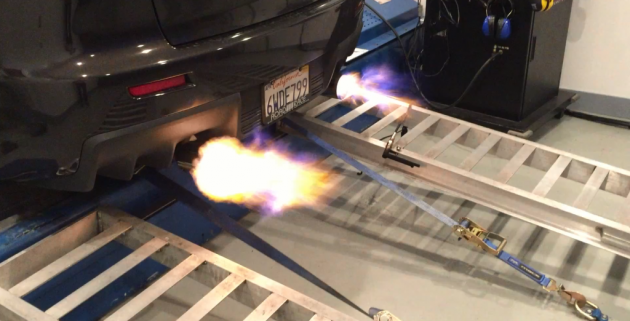 Redditor “fshizl” posted this video of his rich-running Lancer Evolution shooting flames on the dyno on r/mitsubishi, and it just might change your mind. According to the Reddit thread, this Evolution has been tuned to run on E85 and is good for 355 horsepower and 332 lb-ft of torque. E85 is a mix of 85% ethanol and 15% gasoline, and many tuners choose to switch to this fuel, especially if their vehicles use forced induction like turbochargers or superchargers, because of its higher octane rating than pump gas. It has the added benefit of being more renewable than gasoline because fuel ethanol is made from corn. Why does it shoot flames? This happens when unburnt fuel in the exhaust detonates. Cars have catalytic converters now that remove the unburnt fuel from the exhaust, but this Evolution has clearly had some work done to the exhaust and probably has the catalytic converter removed. Oh, the glories of living in a state without emissions tests.